Recorded in several spelling forms including Halvosen, Halverson, Helversohn and Helversen, this is a surname of pre 7th century Norse-Viking and Scandanavian origins. 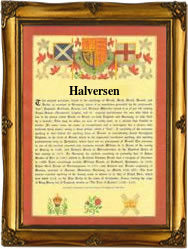 It is a patronymic, and derives from the personal name of ancient times 'Halvor' meaning firm and prudent, plus 'son of'. Traditionally Scandanavian surnames are patronymic, to such an extent that about a two dozen surnames such as Andersen and Johansen in their different and variant forms, make up half of all the population. Furthermore herditary surnames, that is to say names of the same fixed spelling from generation to generation, which have been used in Britain and other pasrts of Europe since the medieval period of the 12th century, are a relatively modern phenomena of Scandanavia, few if any existing much before 1750. It is therefore perhaps suprising to find that this surname has been recorded in the surviving registers of the diocese of Greater London, England, since 1748. Here Peter Spence married Ann Halverson at St James church, Clerkenwell, on September 26th of that year. Later examples include: Peter Helverson, the son of George and Catherine Helverson, who was christened at St Dunstans in the East, Stepney, on August 13th 1769, and Gunerius Halvosen, who married Virgina Klatt, at the church of St Clement Danes, in the city of London, on April 28th 1855.